What is The Difference Between Carbon Black and Soot? - SanAir Technologies Laboratory, Inc. Published On 01/18/2019 by SanAir Technologies Laboratory, Inc. While carbon black is commonly used as a pigment or rubber binder in household items, it’s not uncommon to find it in the air supply. It can wear off of products over time and can even be released directly into the air supply by some items including black printer ink cartridges. It is used as a protective coating on many products with finishes or veneers and is also commonly found in plastics utilized in the electrical and/or plumbing systems within many homes and businesses. Soot, or black carbon, is a byproduct of the incomplete combustion of carbon-based materials such as fossil fuels and oils used to generate energy. This dusty substance has the power to not only negatively affect our health but also contribute directly to climate change by absorbing radiation in the atmosphere, causing the formation of clouds which participate soot back onto the earth’s surface. According to the EPA, if inhaled, soot can cause respiratory and cardiovascular disease, cancer, and even birth defects. While most soot comes from diesel engines and industrial smokestacks, it can be found in residences as a result of cooking and heating stoves and fireplaces. 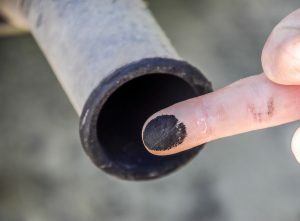 If you’ve come across an unexpected black stain and are concerned about carbon black and/or soot, the only surefire way to know if you are being exposed is through sampling and laboratory testing. In order to identify the presence of one or both of these harmful substances in your home or business, Transmission Electron Microscopy (TEM) is required. TEM is a form of microscopy that uses a beam of electrons which allow the researcher to produce a clean image for analysis at a significantly higher resolution than with traditional light microscopy. The high-resolution image can then be analyzed for the presence of carbon black or soot. Using Transmission Electron Microscopy (TEM), the SanAir Technologies team can detect the presence of carbon black, soot, or possibly a combination of both and connect you to remediation experts who can help resolve the issue before it affects your health. If you’re concerned about the potential presence of carbon black and/or soot in your home or business, contact the professionals at SanAir Technologies Laboratory by dialing 888-895-1177. Our team can provide fast, accurate results so you will have peace of mind when it comes to air contaminants in your space.